Regardless of size, all businesses benefit by being able to pay invoices or to make purchases when they need to do so instead of being forced to wait for approval processes. A business debit card answers many of these issues and provides businesses with the flexibility that they need. Business debit cards are cards with credit card numbers that can be used in the same manner as the way in which business credit cards are used. In general, debit cards have become increasingly popular. From 2012 to 2015, the use of debit cards grew at an annual rate of 7.1 percent. The value of payments made with debit cards grew from $2.1 trillion to $2.56 trillion during that same three-year period. When purchases are made with business debit cards, the money is subtracted from your account rather than being added to a linked line of credit. A business debit card answers many of the issues that can plague small businesses. Business debit card questions: How are business debit cards already helping businesses? A business debit card answers problems faced by businesses regarding high transaction costs. Businesses that use traditional approval processes require people to submit requisitions for items that are needed. The requisitions must then be processed and approved. Then, a purchase order will be issued. Following that, there will be an invoice. Finally, a payment will be issued. This process is time-consuming, and the transaction costs are the same no matter how large or small a purchase might be. A business debit card answers this problem by allowing employees to purchase day-to-day items without going through the lengthy process that larger items require. Using business debit cards can help businesses to save money on their transaction costs. Business credit card questions: How do business credit cards work? Business credit cards are commercial cards with 16-digit credit card numbers. They may be branded as Visas, Mastercards, Amex, or Discover. Some commercial credit cards may also be branded to be used only at a particular chain of stores such as specific gas stations. When people use business credit cards, the purchases are added to the debt balances on the cards. The card issuers must be repaid and often charge high rates of interest on the balances. If you use a business credit card, you may also have to pay annual fees in addition to the interest. Business credit card questions: Why should I consider using a business credit card? A business credit card can be beneficial to businesses because it offers spending flexibility. While they only made up 4 percent of the credit cards in use in the U.S. in 2015, spending on business credit cards accounted for $430 billion in transactions. This means that one dollar out of every six dollars spent on credit cards was spent by businesses in 2015. When you are able to give an employee a business credit card, he or she can use it to make purchases instead of having to use his or her own money and wait to be reimbursed. Business credit cards can also help to build your company’s credit and reputation. When you are always able to pay your invoices on time by using a credit card, your suppliers may be more willing to offer perks to your business or to give you other benefits. Which is better – A business debit card or business credit card? While business credit cards offer benefits to businesses, business debit card answers demonstrate that a business debit card may be a better choice. Business debit cards are not credit cards and will not cause your business to increase its debt. They also do not depend on your credit or cause your credit score to drop from a credit check. Business debit cards are linked to your own account, meaning that purchases that your employees make are subtracted from your balance. Some business debit card answers issues that other cards have by offering features that allow you to set spending controls to prevent unauthorized purchases. By contrast, employees may be able to use business credit cards to buy things that you have not authorized. 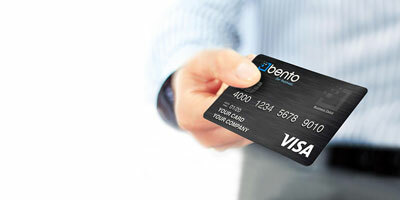 The commercial cards from Bento for Business are Visa debit cards. They are not credit cards, so your credit is not checked when you apply. The cards offer features that are designed for small businesses. You can order as many cards as you need for your employees to use. You can then determine what spending categories that you want to authorize for each employee. For example, you can give an employee who has to drive a card that has been restricted to gasoline-only purchases. An employee who manages inventory can be given a card that he or she can use to pay specific suppliers only. You can also choose how much money to place on each card and set spending limits by the day, week or month. Expense management is vital for the success of your business. Many businesses find that their expenses are difficult to track, and they can balloon out of control. Using business debit cards can provide a solution to this problem while also helping to prevent fraud. Bento for Business uses a powerful API that allows your cards to be integrated with your business’s accounting software. When a purchase is made, the data can upload automatically into the correct spending category in your software. Your employees can snap photographs of the receipts so that they upload along with the other data. These features can help to prevent errors made during data entry so that you can understand where your company stands at any time. You can also log in to your dashboard whenever you want and view the spending information by each card or department. Bento for Business is a company that was created by veterans of the financial industry. It is focused on providing expense management solutions to businesses of all sizes with their feature-rich business debit cards. The cards allow you to determine what each employee can spend, where they can make purchases, when they can make purchases, and how much they can spend. This can help you to keep your business expenses within your budget and to prevent fraud. Bento offers a free 60-day trial so that you can have some time to figure out if the cards will work for you. You can also request a demo so that you can see how the cards would work in action. For more business debit card answers, call us today at 866.220.8455.